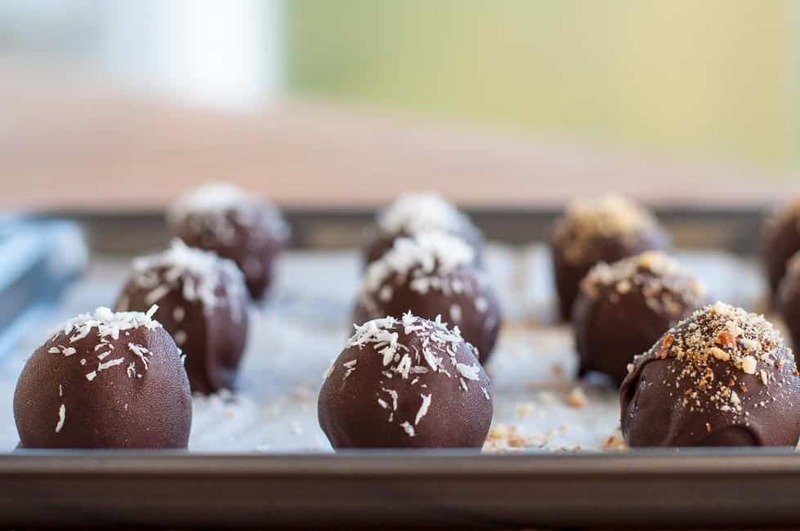 These no-bake Roasted Almond Chocolate Truffles have all the flavour and decadence of a traditional truffle, but they’ll be devoured by your friends and family following paleo, vegan or gluten-free diets. 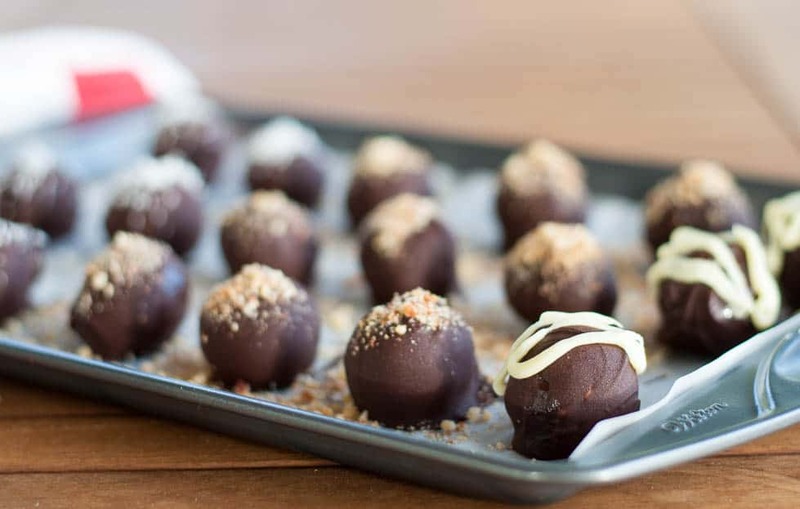 Roasted Almond Chocolate Truffles–oh my! 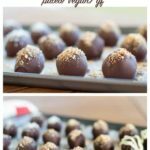 Traditional chocolate truffles are usually concocted with rich chocolate and heavy cream and, if made correctly, will leave you with a sublime chocolate experience that will be etched in your memory. I love the look of these tiny chocolate bombs, but I don’t like all the fat. 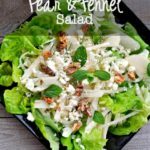 I decided to attempt a healthier version that would be just as satisfying. 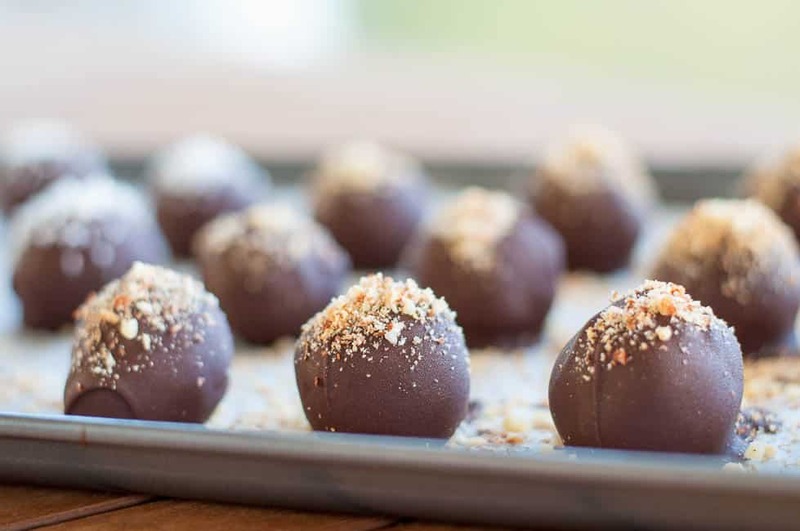 These Roasted Almond Chocolate Truffles were the result. Have you ever dined at a restaurant where the server cushions the shock of your dinner bill by offering a few chocolate truffles on the tray with the check? I suppose the underlying idea is to have you leave the restaurant with a sweet taste in your mouth so you’ll return. Every time I devour one of those, however, I regret that I just consumed a glob of unhealthy fat. 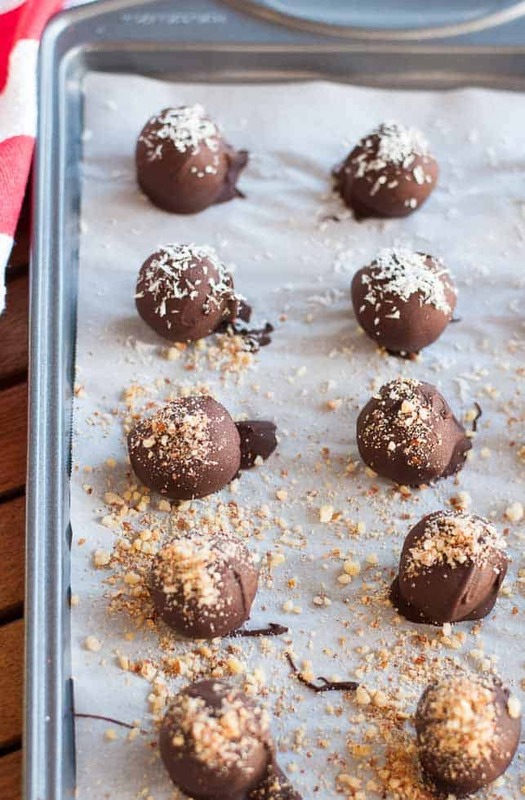 But these truffles are made with soft and squishy Medjool dates, roasted almonds, and cocoa. I flavoured these them with a little pure almond extract and then rolled them in a high quality dark chocolate. One bite into that brittle chocolate shell opened it with a satisfying crack, revealing the soft sweet filling inside. I had a winner! These little chocolate truffles are quick and easy to prepare. Roll into tiny balls and dip into melted chocolate. Drop a truffle into a small bowl of chocolate, gently roll it with two forks, lift it out and allow the excess chocolate to drip off. Then place each one on a parchment paper lined baking sheet to set and chill. 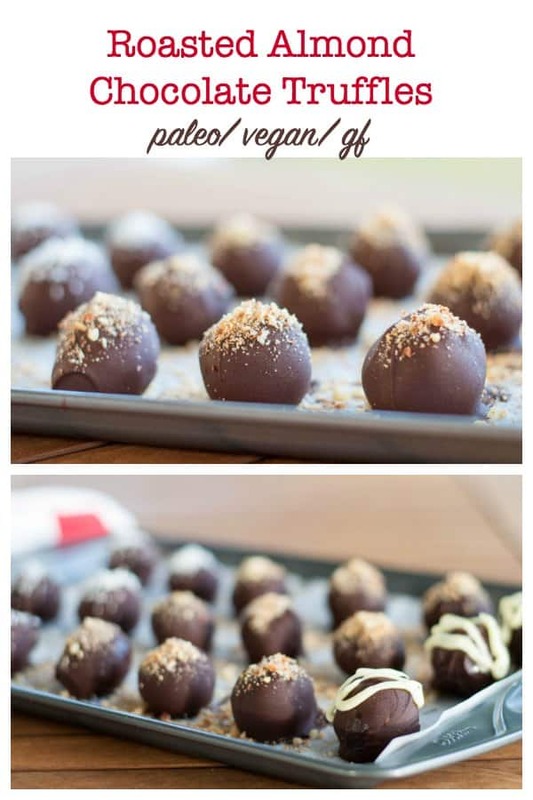 How long will these vegan chocolate truffles last? Store these truffles in the refrigerator where they will stay deliciously ready for snacking for at least two weeks. 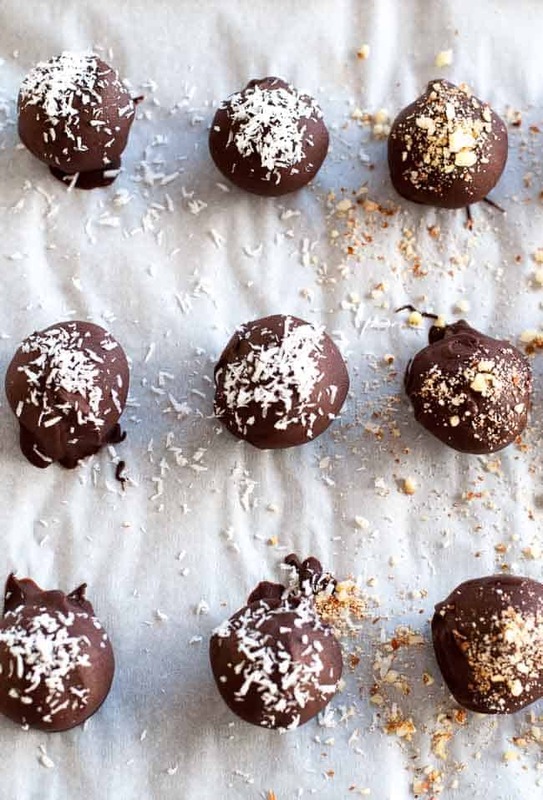 These no-bake Roasted Almond Chocolate Truffles have all the flavour and decadence of a traditional truffle, but they're suitable for paleo, vegan and gluten-free diets. Spread almonds on a baking sheet and roast for 5 - 7 minutes until fragrant and lightly browned. Use a food processor to finely chop almonds. 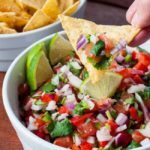 Remove 1 tablespoon and set aside for garnish. Add dates, cocoa powder, coconut oil and almond extract to food processor and process until very finely ground.. Roll into small balls in the palm of your hand. Chill. Meanwhile, melt 5 of the 6 ounces of chocolate over (not in) boiling water. Once melted, remove from heat and add the remaining ounce of chocolate. Stir until melted. This will prevent chocolate from "blooming" or developing white marks. Coat the truffles by dipping in the melted chocolate. 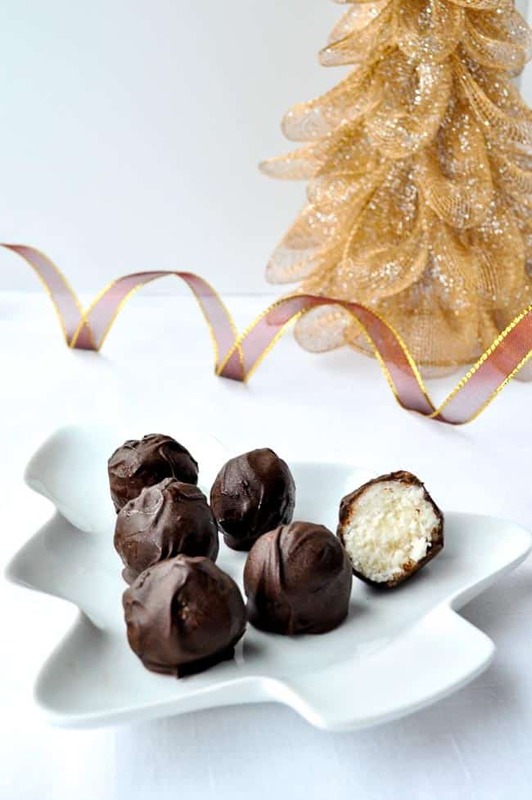 Use two forks to roll the balls in the chocolate, allow the excess chocolate to drip off, and then place on a parchment paper lined baking sheet. Sprinkle some with shredded coconut, some with the remaining tablespoon of roasted almonds and drizzle others with melted white chocolate once the dark chocolate has set completely. Oh my, it’s a good thing these are pretty healthy, otherwise I’d be in big trouble! I whisked them into a container and hid them in the extra fridge in the garage so I wouldn’t be tempted!! My goodness Elaine! I would love nothing more than to come be a taste tester in your kitchen. These look AMAZING! 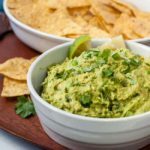 I am pinning them now and sharing them on my Gluten and Dairy-free Recipes facebook page. Yum! Thanks Kimberlly! There’s always something going in in this kitchen. Thanks so much for sharing! It’s great to have something that’s indulgent, (but somewhat healthy) as a sweet treat. Yum, yum, yum! 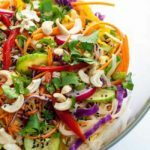 I love the simple, clean ingredients that combine for a big wow factor here. These look like the perfect healthy indulgence — I’ve just pinned. Have a great weekend, Elaine! Thanks so much Justine! I’m greeted by your gorgeous wallpaper every time I open my laptop! Happy weekend to you too. I love the extra step of roasting the almonds here. 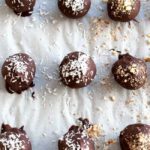 I usually go as straight-forward as possible with healthy truffles like these, just tossing everything in a blender, but the chocolate and toasty almond flavour sounds fantastic. It’s certainly optional, but it really does bring out the flavour. Thanks for stopping by! Thanks LuAnn! Dates are such a great natural sweeetener. Full of fiber too! Thanks for commenting.